I think creative focus is probably a beautiful and helpful thing. If you find that special something that you feel called to do, and really give it your all . . . man, that must be something. I am all about the creative projects but, alas, I do not focus. I’ve always got three or four or five main projects going at a time, with a dozen or so on the back burner. What could I have achieved, if I had just focused on one area of creative endeavor? This is a question I ponder late at night, as I lie awake in bed. But that’s not why we’re here. The fact is, I do lots of different creative stuff, and I like all the stuff I do, so I don’t want to cut any of it. So let’s overlook the shame and regret and be positive, at least until I wake up at 3 in the morning and question all the choices I have made. The positive news is, I had a very productive week last week. First, I got lots of Electric Team stuff done, which is good, because now that we have a Patreon, I’ve committed to making The Electric Team my top creative priority. We have to keep the patrons happy! So I’m glad that I was able to write a long blog post here on the site (go read it, lots of good content), post some fun patron-exclusive stuff on our Patreon page (sign up for our Patreon to check it out! ), sent the files to the printer for The Electric Team #7, and wrote some more script for Sam to illustrate. The Electric Team keeps surging forward. Did you know that an angel wrote a history of the future on a series of silver tablets, and buried them in Alaska? That one of Jimi Hendrix’s guitars can shoot fire? Or that the cloak of World War II-era crimefighter Fighting Yank can still be used to summon the ghost of his ancestor? If you didn’t, don’t feel embarrassed; most people are unaware of America’s rich occult history. But now, after years of research, we are prepared to share these and other marvels. American Artifacts 3 gives full descriptions of 20 magical items uniquely suited to the New World. All 20 artifacts are suitable for use in a wide variety of games. Each entry includes a description of the artifact, background information, and game mechanics. I wrote six of the entries, including Walt Whitman’s lost original manuscript for “Song of Myself” and the original prototype of the Magic Eightball. Carter wrote about, among other things, Teddy Roosevelt’s Big Stick, pictured in the lovely cover illustration by Jeffrey Johnson. 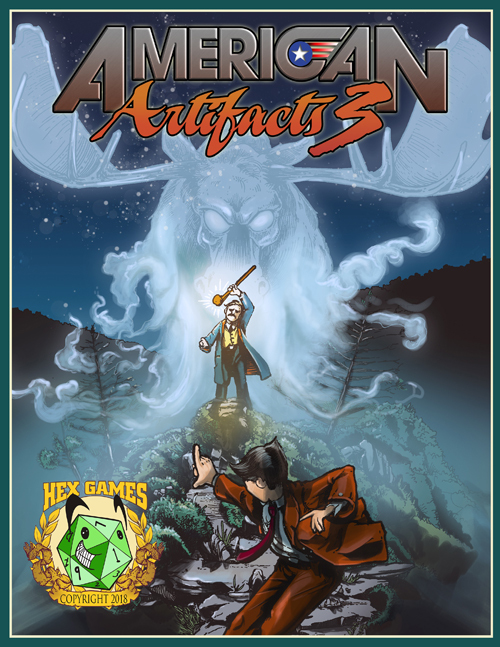 At some point in my life I could have committed fully to writing games, or to writing comics, but I didn’t, so the good news is, we live in a world where there is American Artifacts 3 AND The Electric Team. Yeah. Who needs focus? Focus is lame! The more cool stuff, the better! I’m also working on a couple of short stories, but that’s a subject for another day.